Pneumatic pressing of whole bunches of chardonnay and Savagnin. Static gravity settling (24h) then blending of clear juices with Marc-brandy. The alcohol added kills the yeast in the juice and thus prevents fermentation. The alcohol content of the Macvin obtained is approximately 16.5% PA.
Filtration through cellulose plates (K200), 2400 bottles. Batch: L MAC BL. Cork stopper. 15 years. Once "open", Macvin keeps very well for several months if chilled. Hints of fine alcohol, melon, and walnuts on the nose. Alcoholic but unaggressive attack on the palate, well matured, followed by the sweetness and the richness of the juice, hints of vanilla and walnut. Alone as an aperitif, with foie gras, or with melon and raw ham. 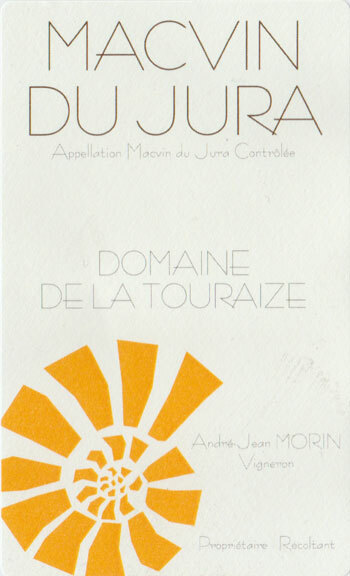 In a cocktail with Crémant du Jura. For dessert with a tarte Tatin and a scoop of vanilla ice cream, walnut cake.